A creeping perennial of sunny sites which grows on rocks and walls. 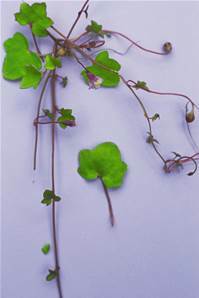 Stems 10-80cm with tiny ivy-like leaves. . Small purple and yellow flowers all summer. The mature seed pods form away from light to find damp crevices in which to grow.